» Long-Awaited Citywide Billboard Inspections to Begin in February: But Will Billboard Companies Sue to Stop It? Long-Awaited Citywide Billboard Inspections to Begin in February: But Will Billboard Companies Sue to Stop It? Almost seven years after the L.A. City Council voted to conduct a block-by-block survey and inspection of the estimated 10,000 billboards in city, the Department and Building and Safety is proposing to start the program on Feb. 1 next year. Whether or not this actually happens is open to question, though, because an assistant City Attorney has said that he expects billboard companies to go to court to challenge whatever fee the city decides to levy to pay for the program. And what is that fee the deep-pocketed billboard companies might find so onerous? The building department proposes to charge $186 per billboard structure for a three-year inspection period. This would pay for three field inspectors to conduct the actual survey and enter the information into a billboard database, plus a supervising inspector and a clerk. The information gathered would be compared to permit documents submitted by the billboard companies, and any billboards erected or altered illegally would be ordered taken down or brought into compliance with their permits. The four companies that sued in 2002 to stop the program–Clear Channel, CBS Outdoor, Regency Outdoor, and Vista Media–have already agreed to the fee in a 2006 lawsuit settlement. According to inventories submitted by the city, the four companies own 6,581 signs, which leaves an estimated 3,500 signs owned by other companies that would be covered by the latest proposal. What if billboard companies fail to provide copies of their permits? In that case the department will research its own records, for which it will bump the fee for the three-year inspection period to $342. Why so much for a minor task? The answer, apparent to anyone who has attempted on their own to comb through records in search of billboard permit information, is that it’s not minor at all, but a daunting, often frustrating job. “Locating relevant permits is a tedious and time-consuming process. Not all billboards have been assigned their own separate and distinct address. Some billboards have been assigned a separate address based upon historical practices for the convenience of the Department of Water and Power and other purposes to allow for billing and a dedicated electrical meter to the billboard company. Many other billboards have permits indexed to the address of the property on which they were initially constructed, which address often changed over time as areas developed and lots were split. Many others have permits indexed to a commercial development address which includes dozens and possibly hundreds of permits in cases where the billboard is constructed upon a large commercial property or mini-shopping center. 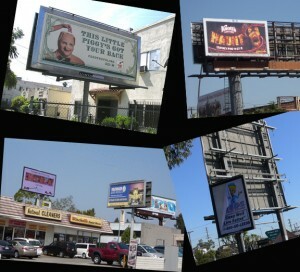 Thus, to locate a billboard permit LADBS must frequently search permits over a range of addresses. The fees and related approvals for hiring inspectors now go to the City Council’s Planning and Land Use Management Committee and then to the full City Council. Will this program which was a critical adjunct to the city’s 2002 ban on new billboards actually get underway in February? Will the billboard companies sue and tie it up in court for another half dozen years, in the meantime putting up digital billboards and enjoying other concessions handed them by the 2006 lawsuit settlement?